You are here: Home / Corporate Responsibility / Work well – but safely! The figures are alarming: Throughout the world, more than 313 million people suffer an accident at work every year. 2.3 million of these people are killed. These figures were announced by the International Labor Organization, ILO. To enable LANXESS employees to work safely the specialist chemical group has introduced the global safety program Xact. Many industrial accidents can be avoided by taking care and paying attention. This is not always the case, however. In Germany alone, there were about 870,000 notifiable work-related accidents in industry and the public sector in 2014. This includes more than 174,000 commuting accidents, i.e. accidents while traveling to or from work. 322 people suffered fatal commuting accidents and 483 were killed in accidents at work. These figures were published by German Statutory Accident Insurance. In comparison with the frequency of occupational accidents in various industries, it is noticeable that the chemical industry is safer than many other industries. This is shown by data from German trade associations for 2014. With 11.71 occupational accidents per million working hours, the chemical industry is, for example, three times safer than the construction industry, with 35.81 occupational accidents. 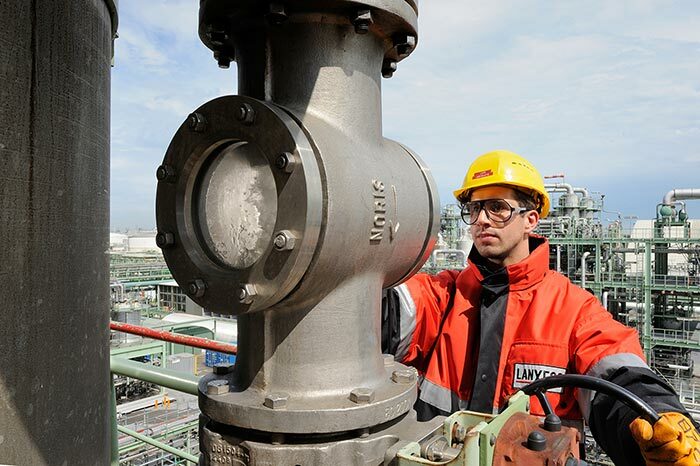 In order to improve occupational safety at LANXESS, the group initiated the Xact safety program in 2011 and gradually introduced it at all of its locations worldwide. Over the course of this program, companies were carefully examined and possible safety risks were analyzed. The program aims to improve safety at work, safety of processes and safety at the plant, as well as to protect health and the environment. “Our employees and our partners’ employees should get home as healthy as they were when they came into work. Meeting this goal is one of the central tasks of our global occupational safety program, Xact,” explains Xact Manager Christoph Mannheims. “Making a company safer is a large and complex task. Employees themselves are the most important part of this,” explains Mannheims. Six “Golden Rules” help to make safety more easily understandable for everyone. 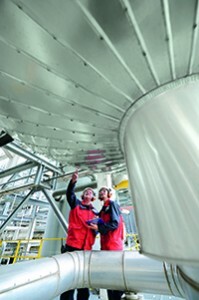 These Golden Rules make up the main principles for safe work at LANXESS and address the decisive points whereby each employee – whether in the plant or in the office – can make an active contribution to their own safety and that of their colleagues, regardless of their job or place in the hierarchy. I always take time for safety. I pay attention to my safety and that of my colleagues. I refuse jobs that I cannot carry out safely. I openly say when situations are unsafe. I take action when I see a breach of safety regulations. I do not give instructions for unsafe actions. 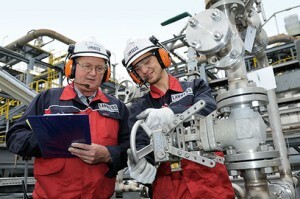 The safety rules create a common understanding of the group’s safety culture. This is based on employees changing their own own conduct and taking action for safety – for themselves and for their colleagues. Because of this, it is important to speak about dangerous situations and unsafe behavior. Unsafe situations and actions are often the cause of accidents. “We ask all superiors and employees to consider where unsafe situations could occur within the scope of their responsibility and how they can counteract them with their expertise,” says Christoph Mannheims. Regular discussions within the company are the key to improving safety at the local level. The so-called safety dialog aims to promote an open and constructive discussion of safety. This is carried out at all levels of management on an equal basis and, ideally, also among colleagues. Documentation of the discussions helps to identify and eliminate weak points. A further module of the safety program is the risk assessment. The performance of tasks such as, for example, taking samples or connecting a tank, is analyzed and assessed with regard to possible hazards. After this, countermeasures are specified. Before employees start on a task they must be familiar with the risk assessment. If an accident occurs in spite of this, the incident is investigated. In the incident analysis a team of employees and experts analyzes the incident and the possible causes. Special attention is paid to technical, organizational and personal conduct. Once the cause has been established, measures are specified to prevent the accident from happening again. Good tools are ineffective without training and instruction in their use. Because of this, LANXESS also provides training material for the Xact modules and assists departments in its implementation and training of employees. Most people imagine exploding tanks and blazing fires when they think of accidents in the chemical industry. Yet accidents involving chemicals are far less common than, for example, accidents involving tripping, slipping and falling – which, in fact, account for the majority of reported accidents at LANXESS globally. Falling down stairs is particularly dangerous. Hardly anybody realizes that every year in Germany, for example, almost twice as many people die in such accidents as in motorbike accidents – only road accidents account for more deaths. 80% of falls down stairs occur while descending, mostly on the bottom two or three steps – this is why it is important to always use the handrail when taking the stairs. To raise employee awareness of these hazards, LANXESS has held a walking circuit at its locations on the Lower Rhine. Various stations demonstrated risks such as uneven surfaces and especially slippery surfaces as well as stairs, where typical slipping and tripping accidents occur. 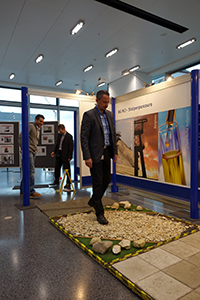 Employees were able to find out for themselves just how easy it is to lose their footing – and the measures that can protect against accidents due to slips, trips and falls. https://webmagazine.lanxess.com/wp-content/uploads/2016/04/DSC_7179_1A_bearb.700.jpg 466 700 Kerstin Stenger https://webmagazine.lanxess.com/wp-content/uploads/2014/05/lanxess.png Kerstin Stenger2016-03-16 11:45:282016-09-30 13:37:12Work well – but safely!